As 'Head Honcho' at the awesome Gigrig company, Daniel has blessed the world's guitar pedal lovers with his amazing loop, switching systems. His most recent 'G2' unit has now been internationally embraced as THE unit to be control even the most massive and complicated pedal/amp systems. 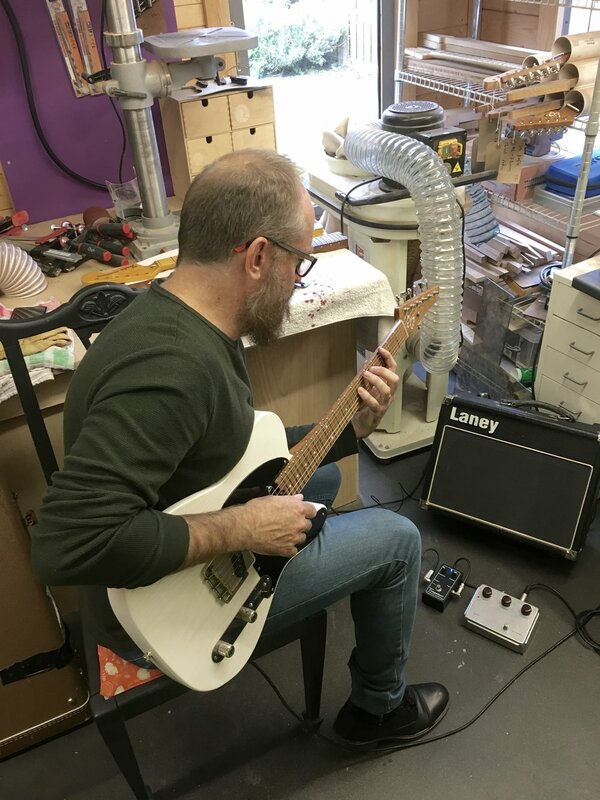 The likes of Radiohead, Biffy Clyro, Noel Gallagher, Steve Vai and Guthrie Govan now use Dan's G2 and more artists are flocking to it everyday. Teaming up with XTC guitarist Dave Gregory in prog outfit 'Tin Spirits', Daniel is also a truly talented guitarist and is very happy to be using a Gray Admiral model. This guitar has a swamp ash body, roasted birdseye maple neck with maple fingerboard, Callaham bridge and a 4-way selector switch controlling a set of Bare Knuckle 'The Boss' pickups, giving it power and bite with plenty of clarity. Daniel also produces the brilliant YouTube sensation that is 'That Pedal Show' - with 50k subscribers, this show is guitar geek heaven. Alongside Guitarist magazine regular and one-time editor, Mick Taylor, Dan reviews and advises guitar lovers all lover the globe with his endless knowledge of guitar FX pedals and amplifiers. Daniel running the Admiral through it's paces! A few tasty effects at his feet - a Klon Centaur, Demeter Compulator, Red Witch Chorus and a Strymon El Capistan straight into a Laney VC-15 all belonging to Gray Guitars. Sounded epic! Here's me with one of my proudest creations - and a great guitar!